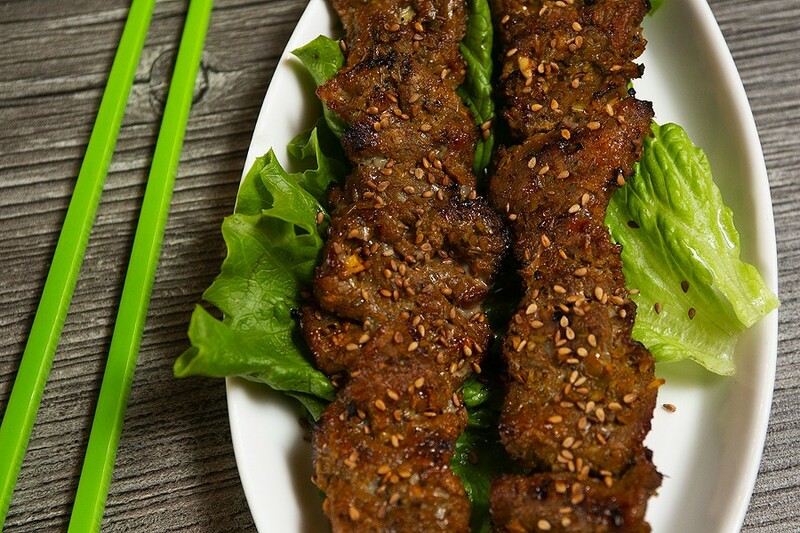 A North Vietnamese specialty takes the stage in Glenview. Progress is not a straight line . . . I think things are gonna work out." That's how Barack Obama reassured Anthony Bourdain over beers and bun cha at a tiny, crowded Hanoi restaurant in the spring of 2016, shortly before everything got fucked. The conversation, eventually broadcast on an episode of Anthony Bourdain: Parts Unknown in the relatively happy days before America's electoral suicide and Bourdain's actual one, at least worked out well for Bun Cha Huong Lien. The restaurant, located just south of the city's French Quarter, is now famous the world over and perennially mobbed, and the tiny metal table and blue plastic stools the handsome couple squatted on are encased in glass for Instagram posterity. Bun cha is a kind of grilled pork and noodle salad, a specialty of Hanoi and Bun Cha Huong Lien in particular, distinct from the more composed bun thit nuong, common all over Vietnam. It's meatballs, cold rice vermicelli (bun), and caramel-marinated and charcoal-grilled pork belly swimming in a bowl of nuoc cham, the ubiquitous vinegar-fish-chile-sauce dipping medium, all supplemented with various herbs, aromatics, and more chiles. 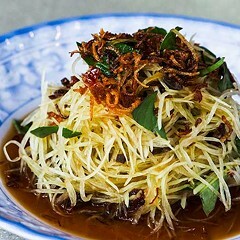 It's commonly served with a pyramid of nem cua be, crackly, greasy-good, crab- and shrimp-stuffed deep-fried spring rolls. 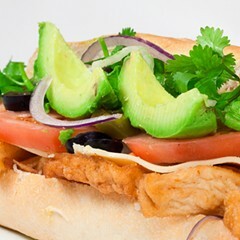 The sum of all these parts equals the kind of harmonic convergence of taste, texture, temperature, and aroma that can, however briefly, drown out the thudding din of existential dread. It's easy to see why the president was enraptured by bun cha. Still, BO (before Obama), bun cha was something of a regional secret, unless perhaps you'd read the long-dormant street food blog Stickyrice and tracked it down yourself in its hometown. 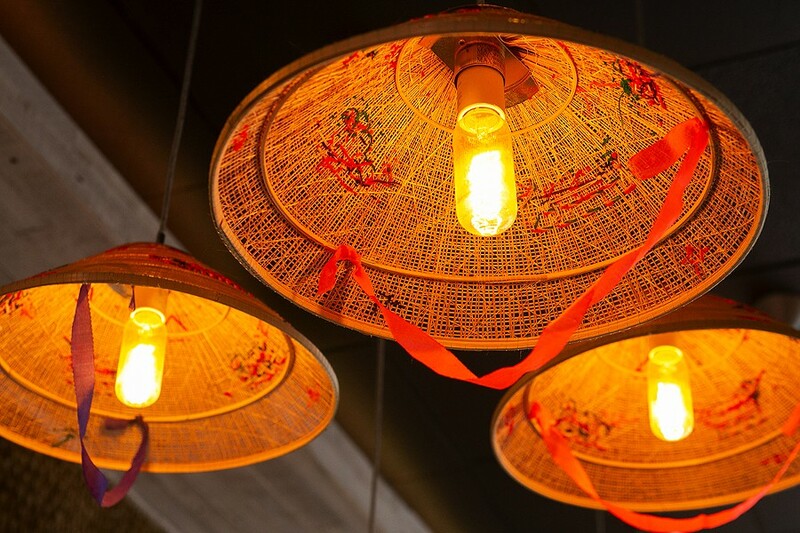 But AO, there are ambassadors of bun cha all over the U.S. in cities with significant numbers of Vietnamese emigres, such as Houston, D.C., and Minneapolis. Shortly after the presidential sit-down aired, Jonathan Gold, 2018's other terrible food-media casualty, published a guide to LA's best bun cha. Tina Nguyen is the North Shore's bun cha ambassador. 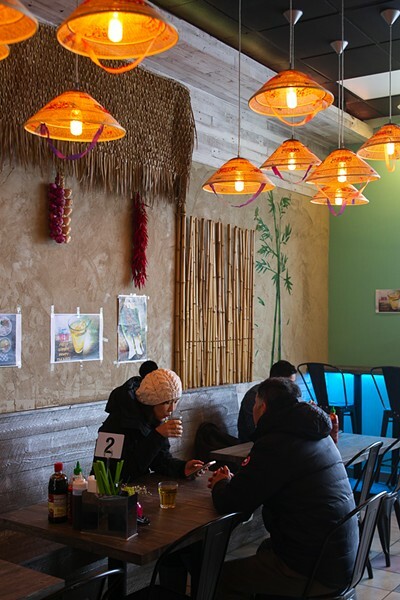 To be sure, you could already find versions of the dish at, say, Uptown's Pho 777 (where flyers posted to the mirrored wall advertise "Bun Cha Obama") or the late Pho Lily, where Nguyen found work after emigrating from Vietnam in 2011. But so far, no one in the city has devoted a restaurant to it to the degree that she has—Huong Lien style—in the same Glenview strip mall as Tous Les Jours Korean bakery, So Gong Dong Tofu House, and Mozu Sushi & Izakaya. Nguyen isn't from Hanoi. She's from Dak Lak province in the Vietnamese central highlands (home of 2017 Miss Universe Vietnam H'Hen Nie). It's more of a bun thit nuong kind of place. But something told Nguyen that bun cha's time on the world stage had arrived. "We love Anthony Bourdain so much," she says, and above her register reads a chalkboard obituary: "Low plastic stools, cheap but delicious noodles, cold Hanoi beer, that's how I'll remember Tony. —Barack Obama." 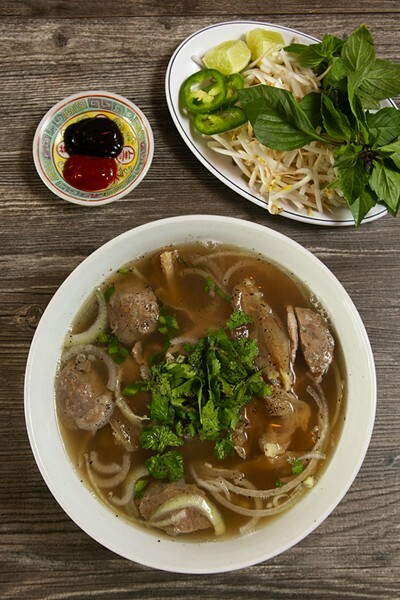 Nguyen's goal, she says, is to make bun cha as popular as pho, with an assist from CNN. Buncha Hanoi has no liquor license yet, so you'll have to bring your own beer. They'll pour it over ice for you. And there are other departures from form: Nguyen doesn't burn charcoal, and the pork belly arrives at the table not steeped in the sweet funky dipping sauce but instead threaded on skewers. The Parts Unknown episode in which Bourdain schools the president on proper bun cha procedure screens on YouTube in the dining room, and it's a useful primer for putting together the disparate elements of the set before you. If the pork belly is a bit dry, that's what the dipping sauce, swimming with quick- pickled daikon and shredded carrot, is for. A single spring roll, tightly rolled and packed with sea creatures, appears on the plate alongside a pair of bouncy pork patties. Dispatch these to your bowl immediately, along with your preferred formulation of cilantro, mint, basil, garlic, chiles, and lime. If your tangle of bun, with its topknot of crispy fried shallots, is somehow not sufficient to absorb your particular brew, a server will bring more forth, free of charge. 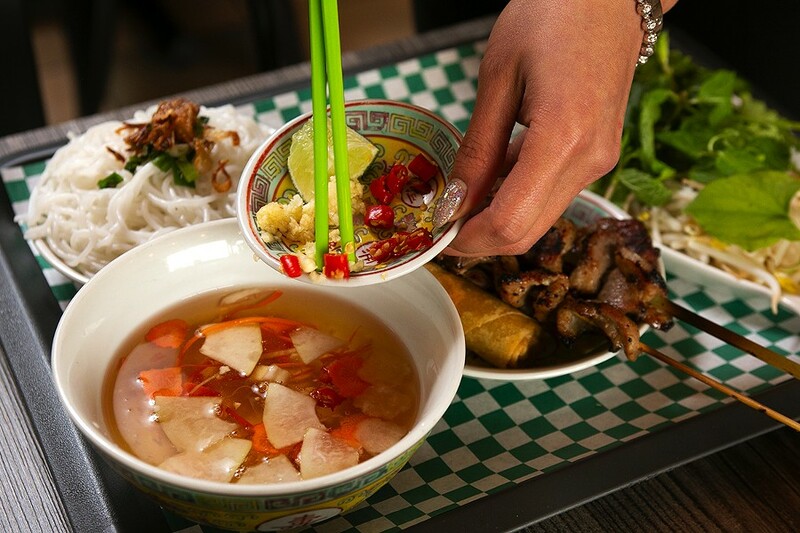 While the degree of specialization at Buncha Hanoi is to be celebrated, there are other options on the menu, which is small and focused compared to the typically expansive offerings at a Vietnamese restaurant. There are banh mi and pho, its beefy short-rib broth simmered for six hours, according to Nguyen. 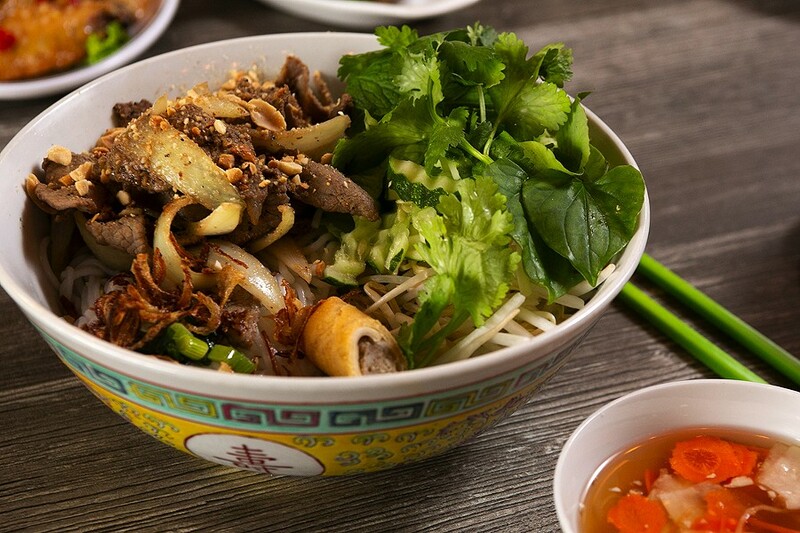 There's a generous, peanut-scattered bowl of bun bo nam bo, beef and vermicelli salad that requires no strategy to consume. 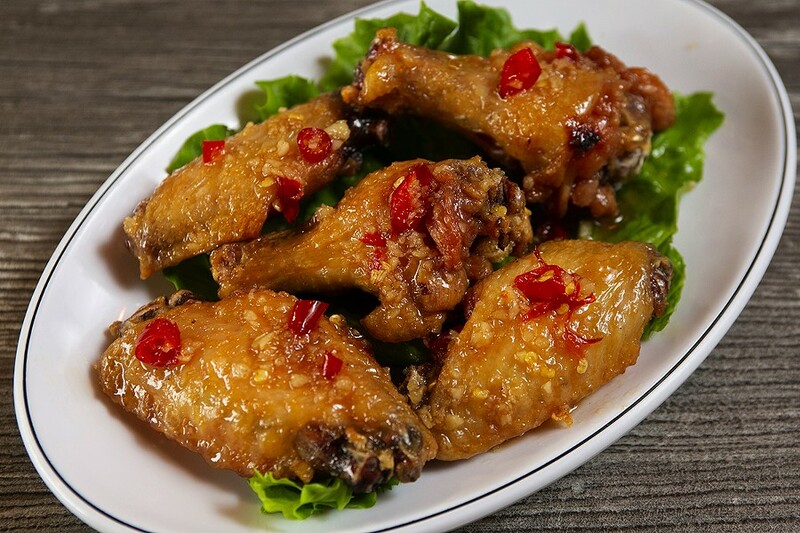 And there are phenomenal chicken wings, sticky with bitter caramel and mined with blazing chile. Glenview, to some city dwellers, might as well be North Vietnam. 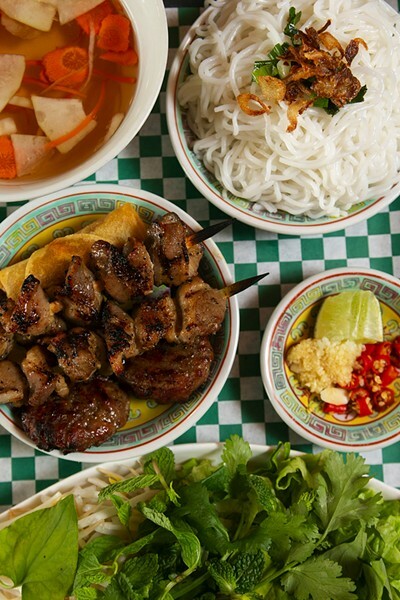 But Buncha Hanoi, located on a strip of Milwaukee Avenue dotted with more interesting eating options than any six blocks in Logan Square, is worth a trip. "We wanted to bring it here in a traditional way," says Nguyen, who seems to speak directly to a particular kind of American eater. "It's not Americanized." The former Embeya chef leads a peasant revolt in Pilsen with homey, unfussy Vietnamese food.